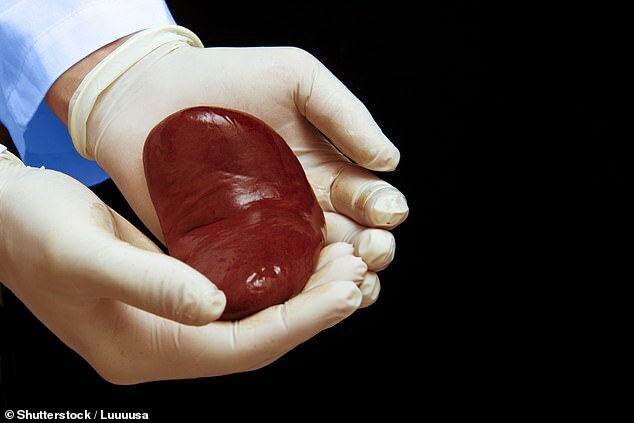 Scientists have successfully grown mouse kidneys inside rats – an advancement that may bring us one step closer to solving the donor organ shortage, a new study suggests. As their embryos – which should have also been missing kidneys – matured, the mouse stem cells developed into rat kidneys. 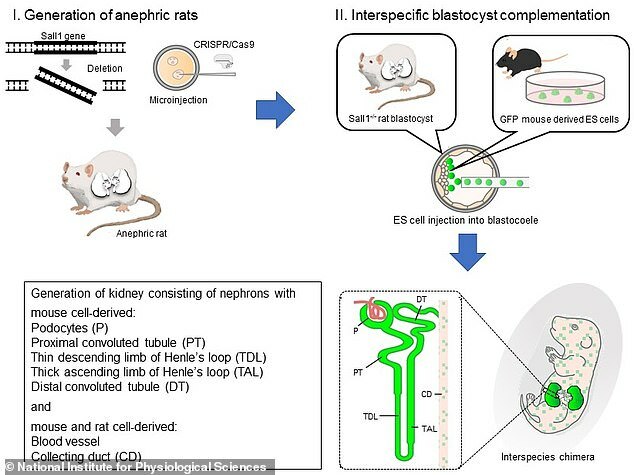 Lead author Dr Teppei Goto, of the National Institute for Physiological Sciences, Aichi, explained: ‘We previously used blastocyst complementation to generate rat pancreas in mutant mice missing the organ. Dr Goto and colleagues believe their results – achieved from just a few donor puripotent stem cells (PSCs) – have major implications for humans. The primitive embryos are injected with stem cells from a normal donor – not necessarily of the same species. In the new study, researchers took blastocytes from healthy mice and injected them into pregnant female rats bred to lack kidneys, and the rat’s offspring were born with kidneys they otherwise wouldn’t have had. Corresponding author Dr Masumi Hirabayashi said: ‘Our findings confirm inter-specific blastocyst complementation is a viable method for kidney generation. In January 2017 his team made worldwide headlines after announcing they had grown mouse pancreases inside rats. When small parts of the organs were transplanted into mice with diabetes, it reversed their disease. It was the first time this kind of inter-species organ generation had successfully treated a medical condition. Then, last August, a US team predicted grow-your-own organs could be available for desperately ill patients within five years. The team at the University of Texas Medical Branch (UTMB) successfully transplanted bioengineered lungs into pigs for the first time. But Dr Goto said there are ethical issues to overcome concerning the creation of hybrid animal-human organs, called chimeras. The technique would involve inserting human cells into pig embryos. So the adult animals could have some human brain cells – raising the question of whether they should be afforded greater moral consideration. Researchers may be able to avoid creating pig-human brains by using human stem cells that have been genetically altered so they are incapable of forming brain tissue.